Retro Bollywood movie poster of the blockbuster Hindi film, Maine Pyar Kiya (1989) for sale. 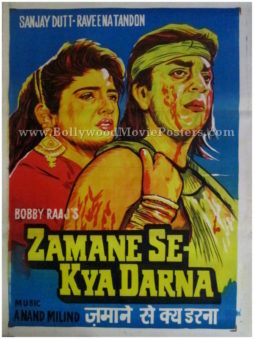 This is an actual surviving original Bollywood movie poster of the 1989 film that starred superstar Salman Khan in the lead role, opposite actress Bhagyashree. Printed and circulated somewhere in the late 1980s / early 1990s, this Maine Pyar Kiya movie poster was originally designed for publicity of the film but never ended up being used. Maine Pyar Kiya marked the entry of Salman Khan into Bollywood – It was his debut film in a lead role, making this film poster highly collectible. Maine Pyar Kiya is a hit Bollywood romance starring Salman Khan and Bhagyashree in lead roles. Songs from the film went on to become a rage throughout the nation and are played till today. Classic Bollywood movie poster of the blockbuster Hindi film, Maine Pyar Kiya (1989) for sale. This is an actual surviving original publicity poster of the 1989 film that starred superstar Salman Khan in the lead role, opposite actress Bhagyashree. 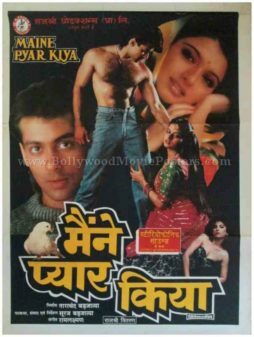 This original Maine Pyar Kiya film poster features the iconic still photo of a shirtless Salman Khan with actress Bhagyashree at his knees. Old Bollywood still photos of the blockbuster Hindi film, Maine Pyar Kiya (1989) for sale. This is an actual surviving set of pictures designed and printed for the publicity of the 1989 film that starred superstar Salman Khan in the lead role, opposite actress Bhagyashree. Maine Pyar Kiya marked the entry of Salman Khan into Bollywood – It was his debut film in a lead role, making this set of 10 Maine Pyar Kiya film photos highly collectible! Printed and circulated after the original first release of the film (somewhere in the late 1990s), this set comprising 10 Maine Pyar Kiya photos was made for publicity of the film and was actually used inside a theater that screened the film! The four corners of each of the 10 Maine Pyar Kiya stills feature punched holes and display tell tale sings of being pinned on the notice board of a movie theater. This set of old Bollywood lobby cards was designed using Maine Pyar Kiya stills (shot on set location) of key Maine Pyar Kiya scenes. The entire set comprises of ten individual stills. Each lobby card features still photographs taken from iconic scenes of the film including several Maine Pyar Kiya photos of Salman Khan. Printed on glossy thick photo paper, this set of Salman Khan Maine Pyar Kiya photos was designed and printed for publicity of Maine Pyar Kiya movie inside a cinema hall. 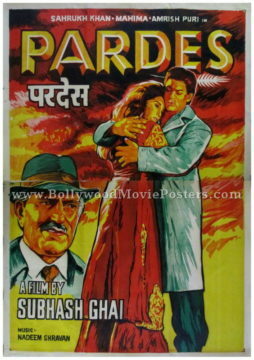 Old Shahrukh Khan Bollywood movie poster of the hit Hindi film Pardes (1997) for sale. This is an actual surviving Shahrukh Khan poster of the hit musical film Pardes directed by Subhash Ghai. Pardes is widely regarded as one of the first major Bollywood movies to have a successful run in the United States, making this Shahrukh Khan poster, highly collectible! Printed and circulated a few years after the first release of the film (late 1990s), this Shahrukh Khan poster was originally designed for publicity of the film but never ended up being used. 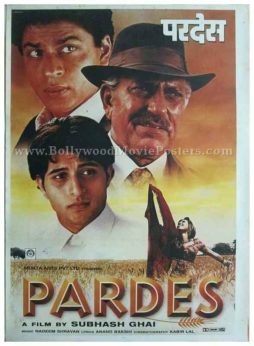 This Pardes movie poster features the lead male characters of the film, Shahrukh Khan, Amrish Puri and Apurva Agnihotri prominently on the top. Newcomer Mahima Chaudary is seen in a smaller photographic still at the bottom. 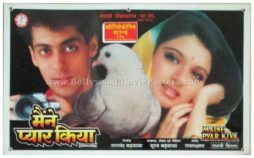 Re-release Bollywood movie poster of the blockbuster Hindi film, Maine Pyar Kiya (1989) for sale. This is an actual publicity poster of the 1989 film that starred superstar Salman Khan in the lead role, opposite actress Bhagyashree. Printed and circulated a couple of decades after the first release of the film (somewhere in 2009), this Bollywood movie poster was originally designed for publicity of the recent re-release of the film but never ended up being used. Maine Pyar Kiya marked the entry of Salman Khan into Bollywood – It was his debut film in a lead role, making this poster highly collectible. Please read carefully before purchasing this item: This is not a vintage movie poster but a recent print released for publicity of the re-release of the film somewhere in 2009. It is printed on fresh paper.